– Geotechnica 2017: Who, What, When and Where? – Just 3 months remain until Geotechnica 2017, and this month in theGeotechnica the team behind the UK’s Largest Geotechnical Conference and Exhibition update us with the current list of Sponsors and Exhibitors for this year’s event. – 5 Steps to maximize the value of your gINT and HoleBASE SI Archive – Writing for theGeotechnica this month are geotechnical data management specialists, Keynetix. This month Keynetix provide advice on how to get the most out of your geotechnical data archive. – I Feel the Need, the Need for Speed – The third article for this month’s issue of theGeotechnica comes from David Bowen, Laboratory Manager at Terra Tek. Here, David asks: Why is it important to get your sample to the chemistry lab for testing as soon as possible, and what can the lab do to help? 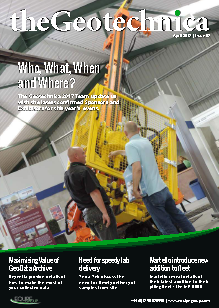 – Martello Expands Fleet with Purpose Built Rig – Providing the final entry into this month’s issue of theGeotechnica are Martello Piling. In the following piece, Martello reveal details of their latest addition to their piling fleet – the MP 6000 which has been designed and built in-house in order to meet the increasing demands of the ever-expanding industry.